With 50% of traumatic brain injuries resulting from road traffic incidents, getting involved with Road Safety Week puts the work that we do into context, and we’ve supported this campaign – delivered by the road safety charity Brake – for several years. Together with our member firms, we commit to raising road safety awareness through regional and social media, and by connecting with local primary schools to encourage them to get involved in the campaign. In recent years we’ve sponsored creative competitions and provided the resources and prizes to help the schools taking part to promote road safety messages. Road Safety Week 2018 took place 19-25 November. 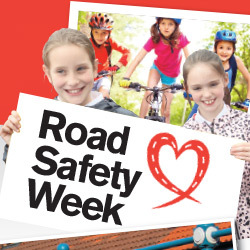 You can see our Road Safety Week 2018 event page here. The theme this year is ‘Bike Smart’, focusing on the safety of those on two wheels who are amongst the most vulnerable of UK road users. Once again we took a tried and tested formula and sponsored creative poster-making competitions in 13 schools to make learning about road safety fun. We provided drawing resources, posters and prizes to give each school a focus for their lessons and assemblies. Ten member and associate members got involved with schools as afar apart as Plymouth and South Lanarkshire. We were involved in around 3,000 children and their families learning more about road safety. Go to our Road Safety Week 2017 event gallery page to see images of some of the fantastic posters created and quite a few very proud prize winners. The Cycle-Smart Foundation was established in 1998 by Angie Lee, a paediatric nurse who saw first hand – and all too often – the devastation that head injuries can cause both to individuals and families. An award-winning charity, the CSF is committed to saving young people’s lives by promoting all aspects of safer cycling. It is particularly concerned with the use of cycling helmets which have been shown to be effective in reducing potential injury to a young cyclist’s head/brain in the event of a fall or impact with an object. As well as lobbying for the wearing of helmets to be made compulsory for children, the CSF also focuses on making sure that helmets are worn correctly. Click here to see a short film containing tips on how to be ‘cycle smart’, and to check that you are wearing your helmet properly. The CSF’s Five Point Cycle Safety Plan launched in April 2018 calls for practical training to be introduced into Early Years learning for children as young as four and five, and for it to continue through to age 13 or 14. You can find more information about the Five Point Cycle Safety Plan by clicking here. The Cycle Safe Foundation works with schools and community groups around the country and has introduced hundreds of thousands of children to the need for safer cycling practices and helmets. It has three head injury awareness programmes that can be delivered at Key Stages 1, 2 and 3. You will find more information on the Cycle-Smart Foundation website. Maisie Godden Hall, 12, survived a cycling accident thanks to wearing a helmet. You can read about Maisie and her life-saving helmet here. Maisie would like the wearing of cycle helmets to be compulsory for all children and has lodged a petition on the government website; she hopes that there will be enough signatures to get a response, and hopefully for the subject to be debated. If you support the idea of compulsory cycle helmets for children, please add your name to her petition before September 2018. And please ask your friends and family to follow suit. Lucy Webb remembers only too well when her son Jamie was hit by a car outside their home. It was a summer’s evening in August 1995 and Jamie, then 7, was playing with his sister and friends across the road. Jamie Webb doesn’t recall the accident or the immediate aftermath as his life hung in the balance. But he is well aware that his brain damage and disability were preventable. Read more of Lucy and Jamie’s story here. Sarah’s son Jarrad was hit by a car in 2007 at the age of 12. He was with his friends who were on bicycles while he kept up with them on his trainers with in-built wheels. No-one is quite sure what happened but Jarrad was hit by a car while crossing the road. “I was told this was a classic case of ‘wrong time, wrong place’ says Sarah. “If Jarrad had crossed a second earlier or later he wouldn’t have been hit. It literally takes a second to wreck a life on the road.” Read more of Sarah and Jarrad’s story here. If you, or a loved one, have been affected by a brain injury as a result of a road crash, we can help in different ways. If the crash was not your fault but caused as a result of a third party, you may be able to pursue a claim that will help cover the costs that you may face as a result of the injury. Find out more about the claims process, and find a specialist brain injury solicitor near you. As part of a claim you would also be put in touch with our support services free of charge, including a family co-ordinator at times of crisis, a financial adviser, and a case manager. Regardless of the cause of your brain injury, we can also offer information about brain injury on our website and via our telephone helpline 0800 612 9660. 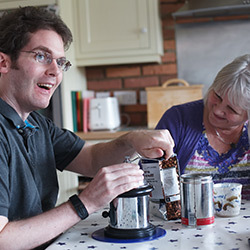 And if you are living with a brain injury and looking for specialist services, whether it’s a case manager, a therapist, a family holiday, or even a support group, you can find it here in The BIG Directory of services. The Brain injury Group provides access to help, support and legal and welfare advice for people affected by brain injury. For free help, support or advice, call us now (for free) on 0800 612 9660.